DiNardo, John E. 2011. 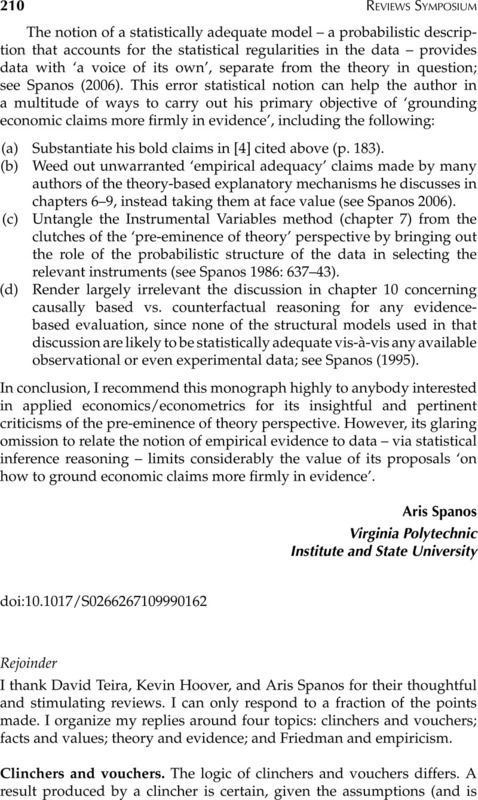 Comments on ‘Error in Economics: Toward a More Evidence-Based Methodology’ by Julian Reiss. Journal of Economic Methodology, Vol. 18, Issue. 01, p. 87. Rose, Roderick A. and Stone, Susan I. 2011. Instrumental Variable Estimation in Social Work Research: A Technique for Estimating Causal Effects in Nonrandomized Settings. Journal of the Society for Social Work and Research, Vol. 2, Issue. 2, p. 76. Rose, Roderick A. Parish, Susan L. and Yoo, Joan P. 2010. Observation, correlation and policy analysis: A response to Foster. Social Science & Medicine, Vol. 70, Issue. 9, p. 1274. Rejoinder - Error in Economics. Towards a More Evidence-Based Methodology, Julian Reiss, Routledge, 2007, xxiv + 246 pages. Mayo, D. G. and Spanos, A. 2004. Methodology in practice: statistical misspecification testing. Philosophy of Science 71: 1007–25. Mayo, D. G. and Spanos, A. 2006. Severe testing as a basic concept in a Neyman–Pearson philosophy of induction. British Journal for the Philosophy of Science 57: 323–57. Ricardo, D. 1817. Principles of Political Economy and Taxation. Vol. 1 of The Collected Works of Davie Ricardo, ed. Sraffa, P. and Cambridge:, M. Dobb.Cambridge University Press. Spanos, A. 1986. Statistical Foundations of Econometric Modelling. Cambridge: Cambridge University Press. Spanos, A. 1995. On theory testing in econometrics: modeling with nonexperimental data. Journal of Econometrics 67: 189–226. Spanos, A. 2006. Econometrics in retrospect and prospect. In New Palgrave Handbook of Econometrics, Vol. 1, ed. Mills, T. C. and Patterson, K.. Basingstoke: Macmillan. Student 1931. The Lancashire milk experiment. Biometrika 23: 398–406. Teira, D. Forthcoming. Why Friedman's methodology did not generate consensus among economists? Journal of the History of Economic Thought.